Forklift aisle widths are typically set when pallet racking is installed. In many cases, such as narrow aisle projects, these spaces are critically important. Typically, warehouse managers don’t attempt to lay out these types of storage facilities. 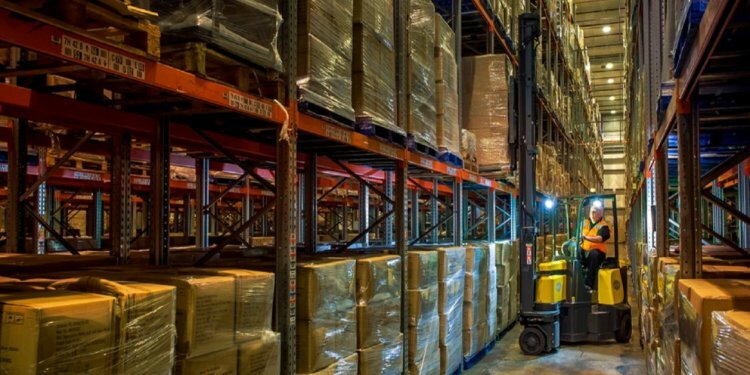 But for reach truck, selective rack applications, these aisle sizes are often “eye balled”, or given a 12′ width no matter what type of forklift is using the aisles. If you are laying out a facility, what criteria should you use for rack aisle width? Head length is the distance from the back of the forklift to the front of the load back rest. Load length is the length of the pallet down the stringer, plus its load overhang. The 6″ add-on is for pallet overhang. Loads can hang over further than 6″. We recommend that you always consult your forklift documentation when making these determinations. Many lift truck manufacturers have calculations designed for their vehicles. Also, for more complex rack design, consult us, or another qualified racking company for assistance.